Overview: Oxygen is an essential gas for many life forms on Earth today, but it did not exist in the atmosphere during early episodes of Earth history. Geochemists invested great amount of effort to study how trace level of oxygen first appeared at about 2 billion years ago and then rose to its concentration of modern atmosphere. Even when the atmosphere was rich in oxygen, global oceans experienced catastrophic oxygen losses in the last 100 million years. Last but not least, on-going global climate change and nutrient pollution are leading to the expansion of marine dead-zones and more frequent hypoxia. This talk will explore the Earth history of oxygen, addressing causes and evidences for changes in oxygen levels. Biography: Zunli has been with Syracuse University since 2011 after obtaining his PhD at University of Rochester and completing post-doctoral research at University of Oxford (England). 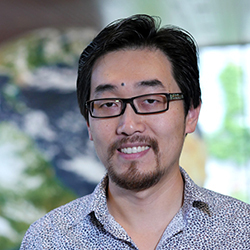 He is interested in using chemical analyses and computer simulations to solve puzzles in the Earth system at different time scales. He is in charge of a clean lab and mass spectrometer to measure trace elements in water, rock and fossil samples. Climate change and oceanography are his main areas of teaching at SU. Other than research, writing and teaching at university, Zunli plays volleyball, table tennis, and particularly enjoys fishing. He’s also learning skating and skiing with his 5 year old boy. Overview: The Earth is very old – 4.56 billion years old, to be exact. Yet it took about a billion years for life to first appear, and another 3 billion years or so to evolve to the complex forms we see today. Together we will journey through geologic time, from the very beginning of life through to the appearance of humans. We will explore the interactions between organisms and the Earth around them -not only how they’ve adapted to changing environments, but also how they’ve caused changes to the environment, from altering the landscape to oxygenating the atmosphere. Through the lens of the fossil record, we will look at the explosion of complex, multicellular life more than 500 million years ago, the transition from life in the oceans to life on land, the rise (and fall) of dinosaurs, the diversification of mammals, and eventually, the evolution of humans. Biography: Emily Judd is a PhD candidate in the Department of Earth Sciences at Syracuse University. Before coming to Syracuse, she earned her BS in Geology, with a minor in Philosophy from the Utah Valley University in Orem, Utah. Emily’s primary field of research is paleoclimate, or the reconstruction of ancient climates. Her research focuses on greenhouse climate intervals – times in Earth’s history when there was no ice near the poles, but instead there were palm trees and crocodiles. She looks at chemical signatures in fossils from these warm intervals to investigate how different environments respond to large-scale changes in climate, so that we may be able to better predict those changes in the future. These days, much of Emily’s work involves looking at 50-million year-old clams from Antarctica to assess seasonal changes in temperature and precipitation. 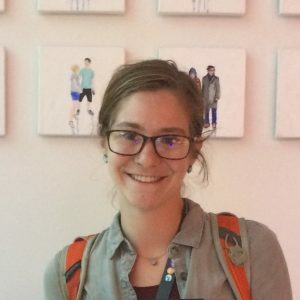 When not in the lab, Emily enjoys exploring the great outdoors, be it hiking, mountain biking, or rock climbing, as well as reading, traveling, and spending time with her giant 12-year-old dog.